Today's post is all about thermals! 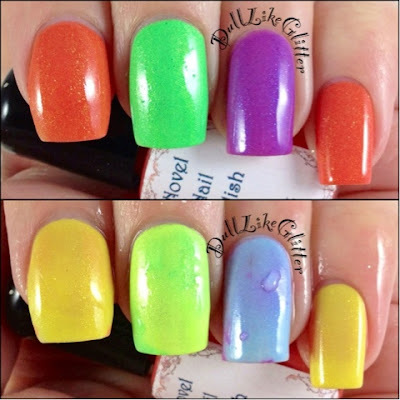 Novel Nail Polish sent me seven gorgeous colors from her Spring Fling collection to review and the kicker is that they're all color changing! Monica, who creates these beauties, sent me three shimmer colors and four glitters. I started with the glitters because they are just so much fun. 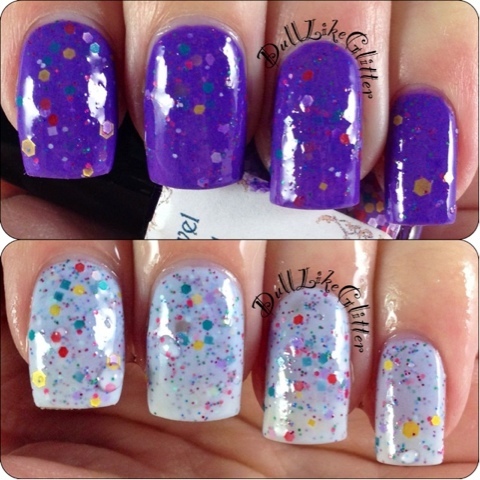 Yep, these are the same polishes! Above shows you the polish in its natural state. The lower bottles are after I left them outside in the sun for about fifteen minutes. They stayed warm and white for awhile, long enough for me to bring them inside and photograph them in my light box. I have seen thermals and color changing polishes before but never with glitter! 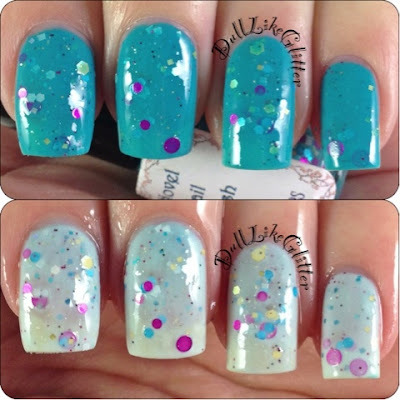 Lover's Tears is a light blue base inspired by Shakespeare's Romeo with green, gold, and bright blue glitters. This is my first time trying a polish with circular glitters and I really like the look! Two coats was a little sheer but three coats was perfect. I am impressed with how creamy this thermal is. I have tried thermals before but all of them are very sheer when warm. Novel Nail Polish is the first color changer I have gotten from an indie creator that stays opaque regardless of the temperature or color of the polish. It is very nice to be able to use a thermal and not have to layer it over a different polish. For the white/warm picture I dipped my hand in warm water so it may appear extra glossy. The glitters are very full in these polishes so I would recommend a top coat to help seal in all the glittery goodness. I didn't find that having a top coat impacted the color change at all. Budding Love is a light pink base named for a quote from Shakespeare's Juliet with pink, purple and scattered green glitters bring to mind the colors of love and blossoming flowers. The formula is excellent and the same as Lover's Tears. Three coats was perfect coverage. In warm water they changed a milky white. This is perfect for those of you that love pink! Love's Course is purple base inspired by Shakespeare's A Midsummer Night's Dream with a whole bunch of colorful glitters in hexs and squares. This is busy and colorful with all the glitters. I found the purple base to be more pastel but when covered with a top coat it darkened a bit. I used three coats for perfect coverage. This one still maintained a hint of purple even when the base was warm. I like the variation of this polish compared to the rest of this collection. Pretty Follies is my favorite based off personal taste! I love this teal blue shade. This polish name comes from Merchant of Venice. Three coats gave me a nice full color. When cool the blue hides the medium blue hex glitters inside. The purple circular glitters really pop though! In warm temperatures the base turns white revealing the blue glitters and changing the whole feel of this polish. The next polishes are still thermal but different from the glitters. These are all full of shimmer. They catch the light beautifully. These polishes all have an iridescent sheen to them. Juliet is an orange polish. When warm it turns a bright sunny yellow. True Beauty is a bright green. When warm it turns even more of a neon green. It almost seems to glow! Sweet Sorrow is a purple shimmer in cool temperatures. This turns a sky blue when warm. It is hard to pick a favorite of these because they are all so well made. Three coats on each gave full coverage and the color changing from one color to another works so well. Overall Novel Nail Polish is constantly wonderful across the board. The glitters are all well thought out and have a beautiful theme. The shimmers all have an amazing color change and the shimmer itself must be seen in person! I highly recommend picking these polishes up, any or all! I have a coupon for those of you who are interested in buying! 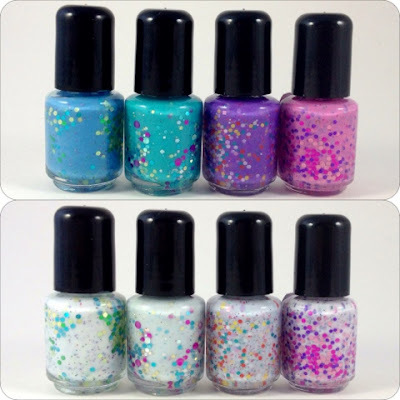 Get 15% off any $10 order when you use the code DullLikeGlitter15 at etsy.com/shop/novelnailpolish. Don't miss out on these beauties! Oh wow, what a cool concept! Particularly like Love's Course and Juliet. I've turned up here after seeing your quilted black matte mani on Facebook, loving all your manis. No trouble at all. 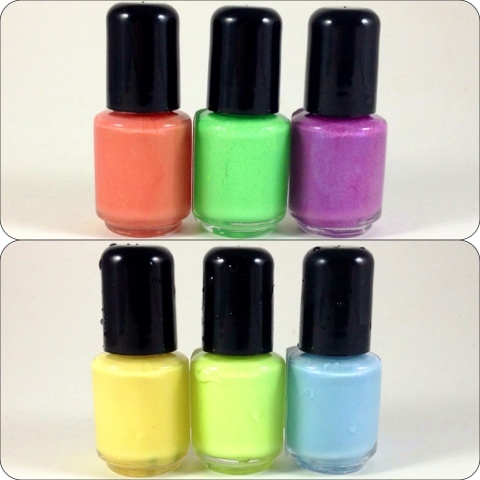 I talked to Novel Nail Polish and she should have some bottles going up in her Etsy store this weekend. You can like her store on Etsy to get alerts when she stocks up. I hope you get what you want! Oh thanks a lot! It's very sweet of you. I'll have a look this weekend. Wish you a big and long success with your blog and nails' passion.